Liz Schlemmer reports on some Wilmington residents' worries over how Hurricane Michael may impact the city's recovery from Hurricane Florence. New Hanover County Schools are just getting back to class, meanwhile the threat of Hurricane Michael has many feeling nervous. 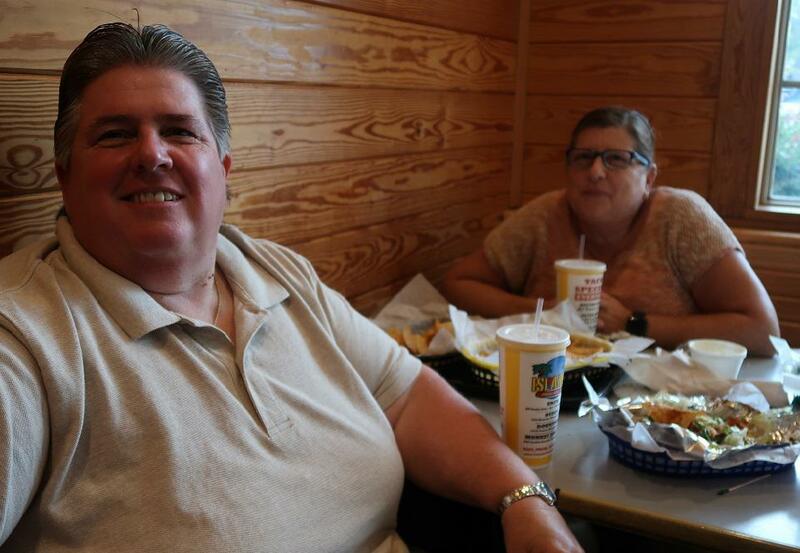 Trask Middle School staff and their families gathered at Islands Fresh Mex Grill in Wilmington for an evening fundraiser this week. 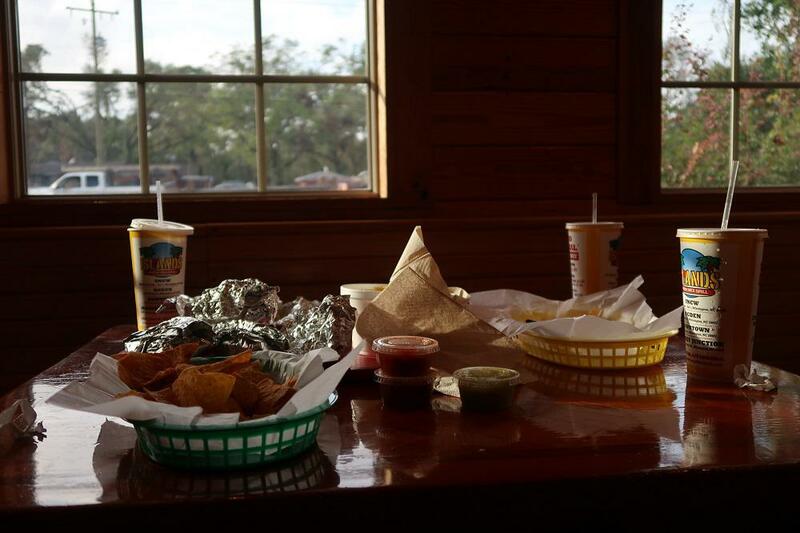 Proceeds from the burritos and taco salads sold will go to the school's Parent/Teachers’ Association. The school’s staff are excited to be together and support the PTA -- which has been doling out Florence aid -- but they also have a new worry on their minds. “Is Michael going to hit us? Have you heard anything? I mean, people are concerned,” said teacher Caroline Rudolph, looking down at new text messages on her phone. 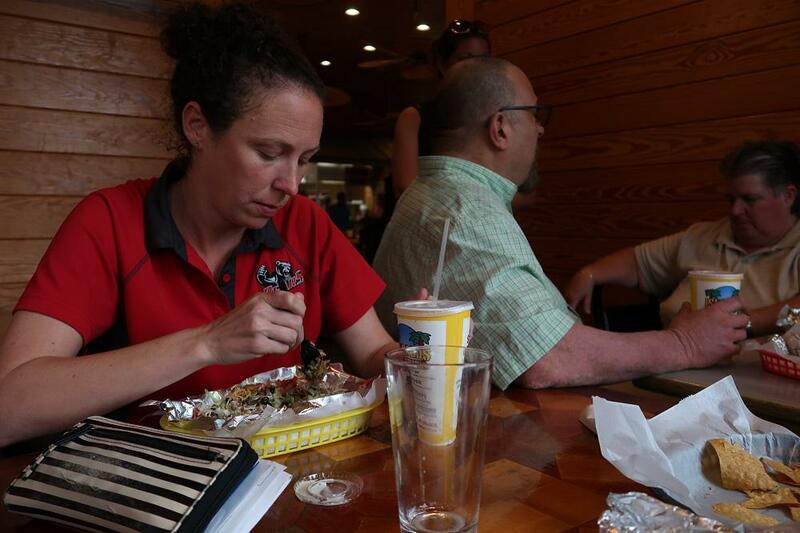 Special education teachers Karen Gerkhardt, left, and Caroline Rudolph, right, discuss their concerns about Hurricane Michael, and their baseball rivalries, over tacos. New Hanover County Schools canceled classes for Thursday "out of an abundance of caution with the approach of Hurricane Michael," according to an email the district sent to teachers and staff. The school’s principal, Maggie Rollison, said that anxiety is spreading across the school. Hurricane Michael is expected to hit North Carolina as a tropical storm Thursday. 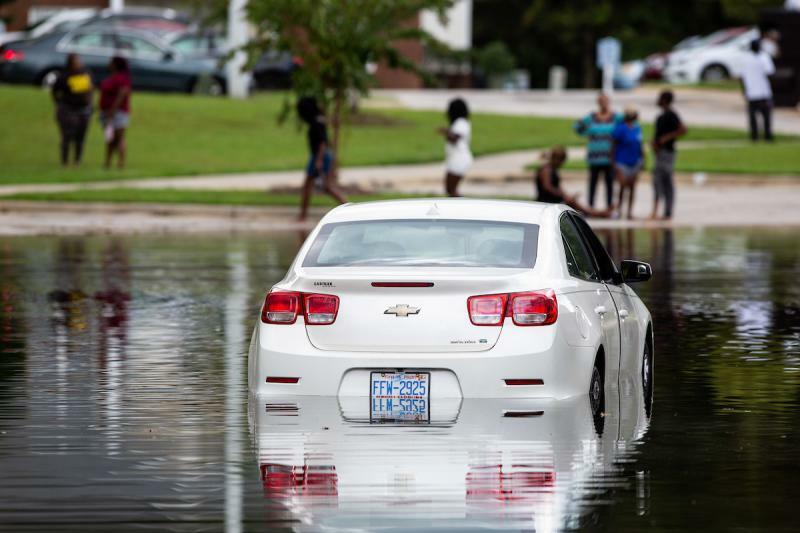 Normally, that wouldn't worry seasoned coastal residents much, but right now, they're vulnerable. Rollison's own roof is months away from being repaired. 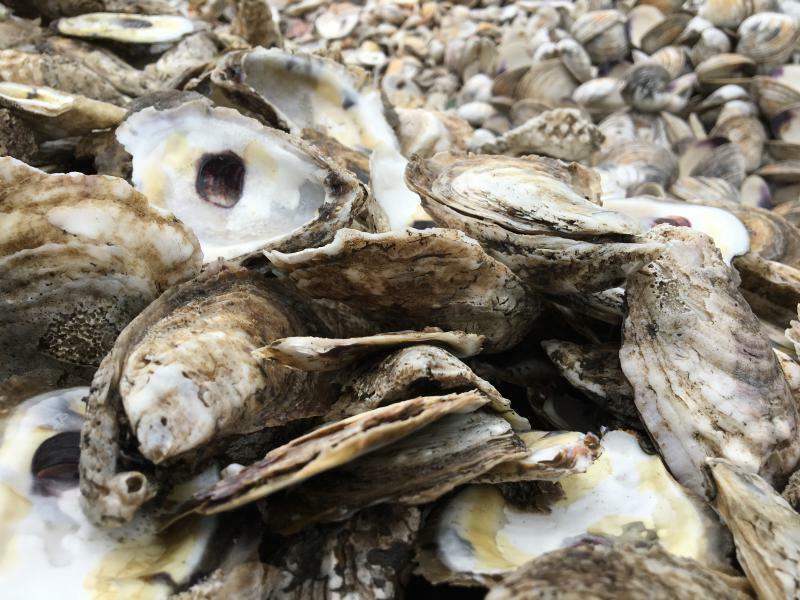 “What we’ve heard are 50 mile per hour winds, and anywhere from 2 to 5 inches of rain, but I think everyone is a bit shell-shocked,” said Rollison. Dr. Maggie Rollison, principal of Trask Middle School, has been helping organize aid to families and teachers. The money raised at the fundraiser for the PTA will go toward buying more tarps, gas cards and cleaning supplies for members of the school's community. One of the school’s guidance counselors, Elizabeth Scharf, said she’s been hearing from students who were displaced from their homes, who are worried about more damage. “They've already been through this, and they're thinking, 'Great! Now our home is drying out and there's hope for us to potentially move back.’ And now those hopes may be dashed,” Scharf said. Scharf has been doing a lot of grief counseling since students returned. Meanwhile, the school's staff are doing everything in their power to help. Rollison spent part of the school day shopping with PTA money. She bought milk and bread for a student's family who lost their cars and couldn’t get to a store and tarps for teachers who needed them at home, so they could focus on teaching. 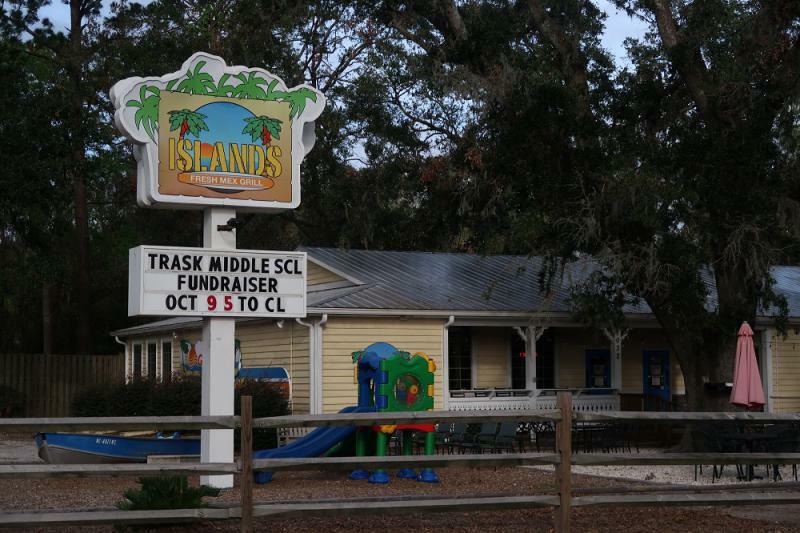 Trask Middle School's fundraiser at Islands Fresh Mex Grill was scheduled before the school year began - long before Hurricane Florence hit. Now the proceeds to the PTA will likely all be spent on aid to families and teachers. How Did North Carolina's Commercial Fishing Industry Fare In Hurricane Florence? Will Michaels reports on how North Carolina's commercial fishing industry might fare after Hurricane Florence. 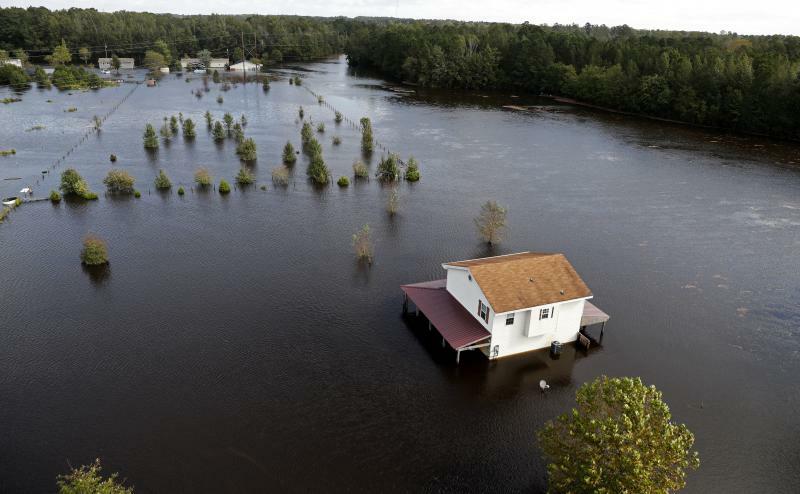 While cleanup crews are getting a good idea of how much the damage Hurricane Florence will cost, it's not yet clear what the storm might have done to North Carolina's fishing industry.